In the 1970s, Madeleine Blais's in-laws purchased a vacation house on Martha's Vineyard for the exorbitant sum of $80,000. 2.2 miles down a poorly marked, one lane dirt road, the house was better termed a shack-it had no electricity, no modern plumbing, the roof leaked, and mice had invaded the walls. It was perfect. Sitting on Tisbury Great Pond-well-stocked with oysters and crab for foraged dinners-the house faced the ocean and the sky, and though it was eventually replaced by a sturdier structure, the ethos remained the same: no heat, no TV, and no telephone. Instead, there were countless hours at the beach, meals cooked and savored with friends, nights talking under the stars, until at last, the house was sold in 2014. 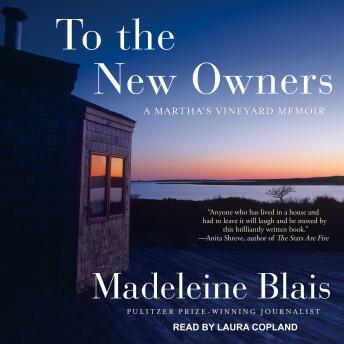 To the New Owners is Madeleine Blais's charming, evocative memoir of this house, and of the Vineyard itself-from the history of the island and its famous visitors to the ferry, the pie shops, the quirky charms and customs, and the abundant natural beauty. But more than that, this is an elegy for a special place.